From distant galaxies in the far-flung future, to ancient history on the planet Earth, Doctor Who is unique for the breadth of possibilities that it can offer a designer. For the first time in history, the Doctor Who Art Department are opening their doors to reveal a unique, behind-the-scenes look at one of the most loved series on British Television. Whether it’s iconic sets like the TARDIS console room, recurring villains like the Daleks or the Cybermen, or the smallest hand prop featured in the briefest of scenes, this book showcases the work of the Doctor Who art department in glorious detail. Discover how the designers work with the costume, make-up and special effects teams to produce the alien worlds, and how the work has evolved from the programme’s ‘classic’ era to the panoramic alien worlds and technologies that delight audiences today. 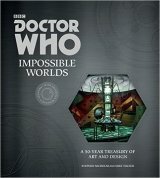 Featuring hundreds of models, sketches, storyboards and concept artworks, many never-before-seen, Doctor Who: Impossible Worlds opens the doors to 50 years of astonishing creative work from one of the most inventive shows on television.